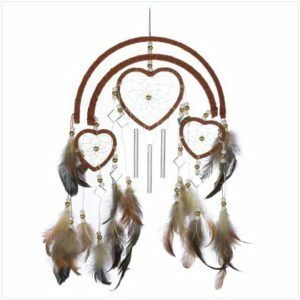 Feathers, beads and faux leather trim add authentic Southwestern styling to this one-of-a-kind windchime! Hang this triple-heart decoration where it’s sure to be admired by all. Item weight 0.1 lb. Feather; thin felt covered plastic; metal chimes. 9″ x 15″ high. Did this blog inspire, inform, or educate you in some useful or positive way? Yes! Because of this, please visit a sponsor, and support the author by clicking one or more of the links below. Thank You! Join the Party! Drink Wine. Be Social. Get Paid.